They said it couldn't be built. That it was a fantasy. That Jack Weyland was a fool, and he had bought the fools in Washington too. But year after year the buckyweave grew, and 'they' stopped talking. The Root really shines if you playing with several remote servers, including already expensive to trash cards like SanSan City Grid, PAD Campaign, Marked Accounts or even Adonis Campaign. I think it harmonizes best with Gagarin Deep Space: Expanding the Horizon. I also can imagine to splash this card in HB decks though. The most beautiful combinations you can make with this card: 1. Rez it at the end of the runners turn. Use it to rez SanSan City Grid for 3. In your turn use the recurring creds to score an Project Atlas or Superior Cyberwalls for free. This means you got 5 creds back already and still have 1 cred on it for the runners next turn. If he chooses to run for it you can use that 1 remaining credit to rez an ice protecting it. The runner will have to pay for breaking that ice, pay 1 to access it and trash it for 4. So the runner just lost 6-7 creds and a click for the run. You basically lost nothing and the SanSan is still in game. If the runner goes for SanSan instead and doesn't trash The Root you will get another 3 creds/turn. Brutal. 2. Use it to rez your economy assets like PAD Campaign or Adonis Campaign. 3. Protect yourself against Account Siphon by spending 6 on rezing it and use the 3 creds to rez Crisium Grid. The runner won't have money to trash both. 4. Use the creds to advance Fire Wall or Ice Wall to insanity and score big money with Commercialization. this plus a 4, means even if the Runner immediately trashes it after one use the Corp is worst case 1 ahead. It's a medium-long term use asset - how much ice are you willing to divert to defending it? The Root is a surprisingly good economic asset. At home in glacier decks, it’s flexible utility can mean a Beanstalk Royalties every turn. It may be thought about in terms of Prepaid VoicePAD; It pays you for what you want to do already: install ice, rez defences, and score agendas. The Root can also help leverage an economic advantage. With Blue Sun: Powering the Future, any remaining credits on The Root can be converted into real credits by rezzing upgrades like Crisium Grid and Ash. Adonis Campaign becomes even more threatening by turning him into, at most, a six credit gain every turn. The Root in concert with Executive Boot Camp can also squeeze more value into your ice by turning empty Hives into four credit gains by rezzing them at a steep discount and pulling them back with Blue Sun. It has does a few downsides. It’s rez to trash ratio is unfavorable early because it is a six credit investment for a moderate tax, and it takes a few turns before it pays for itself. The best window to catch The Root as the Runner is like the sexbots; right after rezzing and before it’s been used. Finally, it competes for deckspace with Midseasons/SEA Scorch. 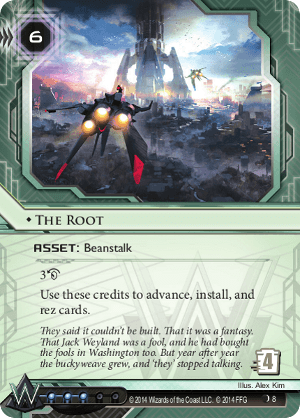 That said, The Root has a home in decks who want to leverage an economic advantage into locked down servers and breezy scoring.